IS is drowning and SS is now my first earner. gostwyck: My only loyalty is to me and my partners pocket! believe you me I have no stocks at IS/getty. you forget that uploading to many sites has a huge overhead. uploading, keywording, disabmiguations, and keeping track of submissions and rejections all takes time. a LOT of time. This is a huge downside for us since we are essentially a one man crew. In addition, this brings down our upload quota on IS to 20 instead of 60, and I hope 90 soon. add to that a much higher rejection rate. Our decision was based purly on our own best economic interest. If we feel this will change in the future we will not hesitate giving up our crown. If IS decide to play around with the goals (as I do suspect they will) then again, giving away the crown is ALLWAYS a possibilty. It's no difference to me whether you stay exclusive or not. You may indeed be better off exclusive. Only you can determine that. But with respect to the hassle of uploading to multiple sites, if you put your keywords, descriptions, and titles in the IPTC data using Photoshop, Irfanview, or other software, then you only have to do that once. All sites can read your IPTC. The other sites also have model release libraries, so you don't have to upload those more than once. And no disambiguation or controlled vocabulary to worry about. All you do is FTP to all sites at once, then assign releases (if necessary) pick a category, and you're done. It takes me the same amount of time to submit images to IS as it does 8 other sites combined. Second best month of the year, SS and FT going most strongly. 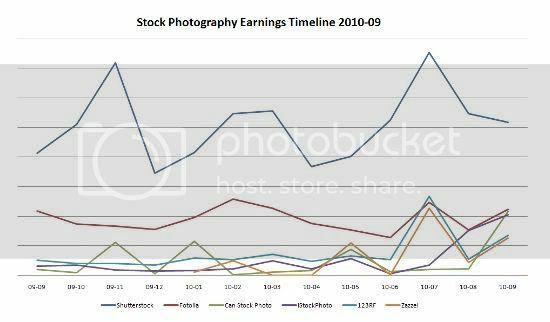 I really hate it that Istock has a fraction of my photos and they still were #1 with 27% earnings. HATE IT. Oh well, looks like they won't be #1 in January if I don't have the guts to take everything down. IS and SS were down about the same for downloads but SS maintained the royalty figures while IS dropped significantly. DT surprised me with a BME and FT has maintained. 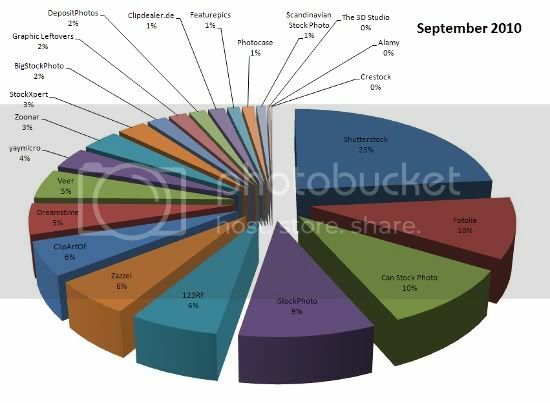 This is my stock photography sales statistic for September 2010. You can find a complete list of stock photography agencies that I work with here. Looks like the summer hole has ended. September had an increase of 39% compared to last month. Sepember was the best month ever for iStockPhoto, Can Stock Photo, and Zoonar. Sales for me have been at their highest in my Microstock History but you never know from month to month. I hope it keeps going this direction. Bad Behavior has blocked 63624 access attempts in the last 7 days.